This blog will not be updated in the future, but please feel free to browse through previous posts using the links at the right. We think you’ll find some useful information there. Please also visit the Social Justice web pages of the Unitarian Universalist Association. I had managed to clip the ropes into the metal loops on my safety belt, and I began to climb the ladder. 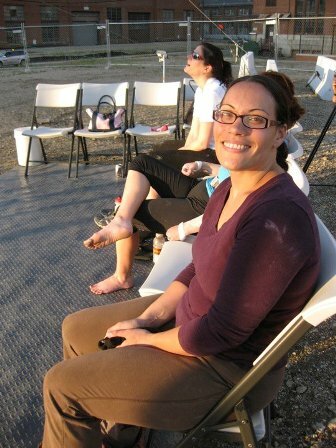 I was about to have my first flying trapeze lesson, and the first step was to make it up to the top of the platform. Someone on the ground reminded me to hold onto the rungs ahead of me instead of the sides of the ladder, and a vision of the whole ladder toppling to the ground with me under it flashed through my mind. I felt safer gripping the rungs, though still a little shaky. I kept climbing. I’m afraid of heights and even more afraid of falling, but I had come to this class with my co-workers determined to face that fear head on. The instructors praised me for making it to the top, affirming that the hardest part, that long climb, was over, and now all I had to do was fly. I didn’t believe them. For me, the hardest part was believing that my body could do something that I thought was impossible. The hardest part was believing wholeheartedly – enough to jump – that I was strong enough. I wasn’t convinced that my body would listen to me, and I knew myself well enough to know that if I didn’t believe it was possible, it wasn’t going to happen. So I waited for some faith. And when it didn’t come right away, I waited some more, and then I looked for it. I needed a few moments on top of that platform, holding on for dear life before I let go. My faith started to surface not when I thought and bickered with myself harder and harder, not when I tried to reason myself out of sheer panic, but when I turned off my brain and trusted. The whole experience, the instructor reminded me, was designed to feel like the scariest thing in the world, but to be one of the safest. From the moment I clipped my belt into the ropes on the ground to the moment that my feet were back on the ground, I was completely and totally safe. Someone was holding those ropes, and they were not going to let anything bad happen to me. They promised. I didn’t think about this until later, and only then with some prompting and prodding, but the work that I do, the hard work of advocacy, is based in large part on faith too. I don’t always have faith in the long and tortuous legislative process, but sometimes it comes through. I do have faith that the ripples of my work help move my corner of the world towards justice. At the trapeze rig, the instructors gave me a choice. I could turn around and climb back down the ladder to get to the ground, or I could fly down. It was as simple as that. The faith came after I made my choice. Not being one to back down from a challenge, I chose to fly. The faith came when I could close my eyes for a moment, and through the teary panic, see myself flying and landing safely. The faith came when I knew that I would be safe and loved no matter what. And I flew. I make the choice to conquer the choking fear I feel when the news tells me that the world is un-savable. I make the choice to be an advocate and an ally because so many others are silenced, and I can speak. And I know I’m not working alone. I’m surrounded by smart and passionate colleagues who challenge me to reflect upon and live out my deepest values. I am grateful for their accompaniment on this path. My faith came from my ability to see through fear and despair into hope. My faith came from my ability to visualize the future, to see where I am in relation to those around me, to locate myself and my gifts and to use them to make change. I will always be learning. At my first trapeze lesion, even though flying only meant swinging from the bar and landing without any fancy tricks, everyone told me that I was the one who had done the most work that night. I was the one who had accomplished the most because I crossed the long distance between fear and flying, and then I made the leap. Right Speech When So Much is Wrong! People are posting all kinds of stuff on blogs, facebook, and in private emails. Some folks are mad at the President for not demanding that Jones stay, for not standing up to the attackers. Some people are mad at Jones for going to the White House after a career as an edgy leftist activist, leaving the door open for attacks. Pretty much everyone is furious at Glenn Beck for the scurrilous attacks, filled with lies. Tim Wise is urging Jones to sue for slander. The Buddhists say there are three questions to ask in order to determine if something is ‘right speech’: Is it true? Is it kind? Will it help? It’s hard to know exactly what kind of speech can help us now. But I think we need to fumble around and find it. I sat on a plane today from Minneapolis to Boston, wedged into a seat with two fundamentalist bear hunters from rural Minnesota. My braver self encouraged me to find some way to talk to them about their views of what’s going on right now, and to have a civil conversation with them about it. To act worthy of respect by being respectful. My more scaredy cat self said, “Yeh, but you’re on the inside seat!” and put on my iPod instead. I keep wondering what would have been said if we had engaged in discourse about health care, the President’s address to schoolchildren, Van Jones’ dismissal. Could we find common ground that brought us together? What kind of language opens doors to real sharing? Without taking risks with each other to find the words, we’ll never know! It’s unusual to feel a need to reach out to our UU community because a Senator died, but the death of Senator Edward Kennedy casts a long shadow across our nation. Senator Kennedy’s death is a signal of the passing of the torch from one generation to another in our nation and in the world. It is a call to remember and to honor all of those elders whose struggles for justice have made our lives today possible. It is cause for both grief and for deep celebration. In the UUA’s Washington Office on Wednesday, staff members spoke to one another quietly, remembering personal encounters with him in labors for shared goals—some which were accomplished and many which remain unfinished. It is hard to overstate how important Senator Kennedy was to the causes we hold dear. From Voting Rights and Disability Rights to reauthorizing TANF (Temporary Assistance for Needy Families); from more than a decade working to pass anti-hate crimes legislation and the Employment Non-Discrimination Act to ensuring a fair minimum wage, Senator Kennedy was a relentless supporter—if not a champion—for most of our legislative agenda. Few people in this era have done more for the health and welfare of marginalized people. This respect for the inherent worth and dignity of every person was at the heart of Senator Kennedy’s desire for our common good. May that respect live on as our legacy for Senator Kennedy—in our families, in our congregations, in our towns and cities, in our struggles for justice. May we find the strength to carry on without him.